Memory theatre is an ongoing experimental project, which has so far been manifested as a video installation, plein-air performance and a theatre performance, which is a form of continuation of an earlier project – Fragment and Trace. Recurring themes in Kirwan’s conceptual practice are memory and memorial and fragment and trace. The idea of the trace as a mark that has barely been made or that may disappear, and asks was something there, and was something left behind? This involves the pursuit of that which is apparently elusive; not necessarily in order to achieve a goal at the end but to consider the thing that cannot be held. The work is underpinned by her philosophical inquiry into the concept of the fragment especially as suggested by Frederich Schlegel who posited its radical recasting as a dynamic practice which aims at fragmentation for its own sake. This essential incompletion is itself a mode of fulfilment in which the idea achieves itself and constitutes the ‘properly’ romantic vision of a system in which totality is both finite and plural at the same time. This dynamic process of thinking that is both self-defined and simultaneously defining itself is at the core of Kirwan’s practice which opens up questions about the relation between the finite and infinite, unity and chaos. Kirwan acknowledges and explores the partial nature of the fragment as a shard of memory which oscillates between past and present. Her work questions time, space and existence through an enquiry into what is memory and how might it function and be represented. Central to this, is the question of how is time in itself memorial and memory? 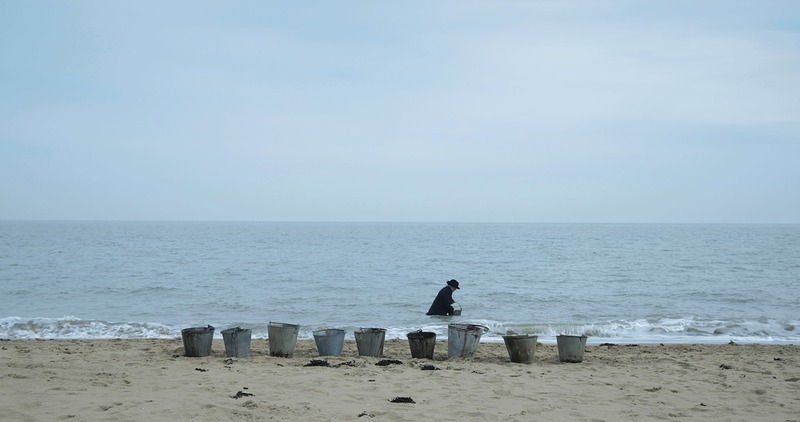 Drawing on her own experience of sudden traumatic loss and widowhood, Kirwan’s performances generally involve the enactment of pointless tasks such as measuring the water in the sea with buckets. Seemingly endless repetitions emphasise the absurd but for Kirwan also, are a kind of practice of the philosophical fragment. Repetition evokes also endless searching and yearning which some psychologists identify as intrinsic to the bereavement process. Intrinsic to Kirwan’s futile reiterations and journeys is the essential incompletion which is itself the mode of fulfilment. However, the sensorimotor and haptic elements of her performative encounters serve also as a metaphor for navigation: as tools for orienteering and personal mapping in the fog of bereavement. And yet… all deaths presage other deaths…thus as the widow awaits her own, she marks with infinite futility and pointlessness, the finitude of human existence. 1 Simon Critchley, : (Fitzcarraldo, Editions, London, England 2014) , p.7.